This road map aims to gather the pro-sovereignty organizations that share the objective of Catalonia that begin a process of democratic transition in order to become an independent state, if that's what the majority of its citizenry so decide. The elections on September 27, 2015, characterized as a plebiscite, will serve as a legal mechanism to know the will of the Catalan people on their politicial future, in place of the referendum which was blocked from being held. In this way, the result will be definitive and easy to read by everyone, inside and outside Catalonia, and it will allow for the exercise of the corresponding mandate. The sovereigntist candidacies must make it clear in their platforms, first and foremost, that voting for them means pronouncing oneself in favor of the independence of Catalonia. The national and social elements are inextricably bound together, therefore, it is necessary to make a definitive bet on the recovery of the social state, especially in education, healthcare, and pensions, as well as in social rights and essential public services. It is absolutely necessary to express an undeniable will of democratic regeneration, transparency, accountability, citizen participation, and the fight against corruption. 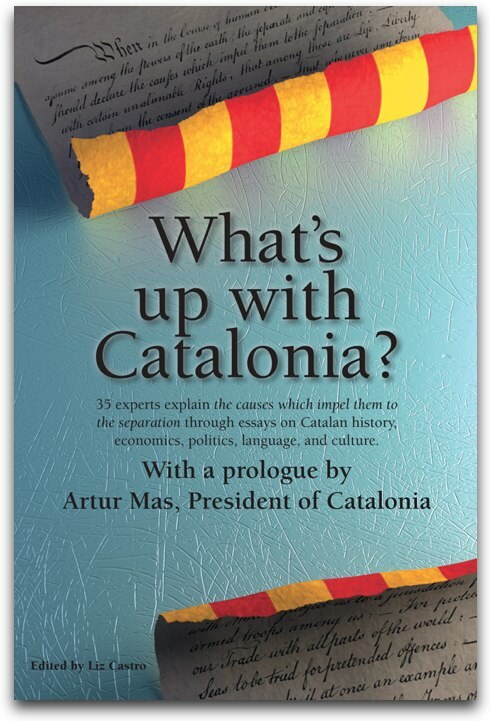 Setting up a project of writing a constitutional text in a term of approximately 10 months, by way of a participatory mechanism that facilitates gathering more voices around the project through an open constituent process in which there is direct citizen participation (a Catalan Constitutional Convention), and which is later subjected to a referendum. Exercising the sovereign acts necessary to construct the new country. 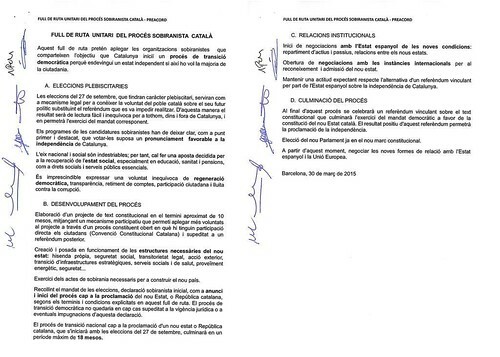 With the mandate of the election, an initial sovereigntist declaration, as an announcement and the initiation of the process toward the proclamation of the new State, or Catalan Republic, according to the terms and conditions made explicit in this road map. The process of democratic transition will not be subject to the [current] jurisprudence in effect or to eventual overrule of this declaration. The process of national transition toward the proclamation of a new State or Catalan Republic which will begin with the elections of September 27, will be completed within a term of 18 months. Negotiations will begin with the Spanish State on the new conditions: distributing assets and liabilities, the relationship between the new countries. Opening negotiations with international bodies for the recognition and admission of the new state. Maintaining an open attitude with respect to an offer from the Spanish State of an alternative binding referendum on the independence of Catalonia. At the end of this process, a binding referendum will be held on the constitutional text which will culminate the exercise of the democratic mandate in favor of the constitituion of a new Catalan State. A positive result in this referendum will allow for the Proclamation of Independence. Election of a new Parliament in the new Constitutional framework. From this moment forward, negotiations begun on the new form of relationship with the Spanish State and the European Union.